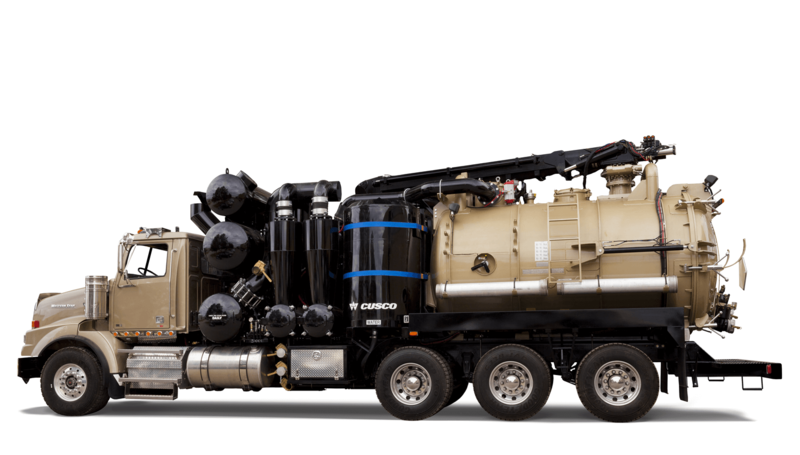 Cusco is pleased to introduce its totally redesigned Hydro Trencher series of equipment that provides separate water storage containment in dual 500 USG stainless steel vertical water tanks. With this design, weight distribution is improved along with corrosion resistance and safety improvements when dumping. This premier hydro excavator is designed for directional boring and removing waste materials including; liquids, sludge, slurries, mud, gravel and other solid waste. The Hydro Trencher Series is available in a wide range of configurations that will enable customers to meet their specific needs. It comes standard with cyclonic filtration technology, a vacuum system with airflow ratings of 5,300 CFM and generating 28″ Hg of vacuum, as well as a wash pump capable of 18 GPM at 3,000 PSI, an enclosed hot water burner system and high pressure water jetting, storage cabinets/stand-up lockers and an 8″ hydraulic operated boom with a 22ft. reach. Whether you are excavating around fragile oil and gas pipelines, installing fiber optic cables, repairing utility lines, or excavating in remote areas with limited access, Cusco’s Hydro Trencher is fully equipped to do the job at hand! Available Options: Stainless steel waste tank construction, heated valves and other custom made items. FOR PRICING OR MORE INFO CALL TODAY!